I know, it’s been a while, right? I’m not going into the reasons for the long hiatus in the City of Bridges story (you can dig up some details on personal blog, if you’re interested, though to be honest I haven’t written very much there either). Leave it to say that some stories live in your heart, no matter how long it takes you to come back to them, and I’m finally ready to come back to Corregal, and to Neda and the boys. It’s been a slow process, but over the past couple of months I’ve pounded out several potential next episodes–most of which you’re ever going to see. Unfortunately, after I finished writing, I realized the adventures described were just not right for this point in the tale. I wanted to do something that delved a little into the magical side of this world, while providing a bonding experience for Barris, Tierce and Romeric, but what emerged was just way too intense for them to go through just yet. Still, the exercise was useful, as it helped to stretch my too-long neglected prose writing skills and reminded me that, yeah, I actually do like this fantasy writing gig after all. At any rate, I have an alternative episode, much more mundane, ready to post in the next day or two, and the one after that ready to fall off my fingers and onto the page. (As if it’s ever that easy!) So keep an eye out for new story content here very soon! Also–and this is a big ALSO–for the first time in well over a decade–I’ve returned to work on the original novel for which City of Bridges was only ever meant as a prequel. If you have read the About page here, then you know that all this started as a NaNoWriMo novel way back in 2002. Even though I loved the characters and the setting, I have never been able to figure out how to fix that sad, overwrought bit of work, and it’s languished in the metaphorical trunk every since. But in mid-April, I was struck with a sudden bolt of inspiration–I’d like to say it made everything click into place, but that isn’t true. It was just one idea that spawned an obsessive desire to make it all work. It’s taken a lot of intense work on characters, world-building and plot, but I finally have the bones of something that I think makes a good story, and I’ll begin writing it soon. My goal is to have a critique-ready draft done by the end of the year–I’m not getting any younger, folks!–so it will be taking a priority when it comes to writing time. I still hope to post here regularly, but we’ll have to see how it works out. Writing about the same characters some ten years apart may not be easy. I may be biased, but I think it’s impossible not to love them! Calette knelt at the midpoint of the bridge beside the rail, heedless of her rumpled silk skirts and the braids that had come loose from their silver pins. Twisted awkwardly, she could maneuver both head and shoulders between the carved posts. Occasional passersby cast odd looks her way, she didn’t notice. She was lost in the sun-dappled waters of the river Aris. Long ago, the posts of the balustrade had been carved to resemble notable members of the House that had built the bridge. You could see hints of faces here and there – a sharp nose, a dimpled chin, a mouth twisted into an ingratiating smile. The rest worn into obscurity by time and weather. No one remembered who they were anymore. Calette, when she was little, had made up names for them, and tried to guess how each one was related to the next. But even those apocryphal identities were lost to them now. She had chosen this sparsely traveled bridge for her quest because she knew there would be few travelers to disturb her. There were more convenient bridges along the Aris, and more picaresque ones too. Only those who were lost would come this way, or those on quests of their own. She would be left alone. That, and the spaces in the balustrade that were just wide enough room for a slender, sixteen-year-old girl to lean through if she sought an unimpeded view of the river below. Illumination was the purpose of her quest. The river was full of the light. With the sun high overhead and the summer sky nearly white with heat, the luminous current was an ever-changing panorama that Calette sought to memorize. It wasn’t, she realized, something most people paid attention to. The structure of light. The way it moved upon the water – or through the water. Transparent one moment, opaque the next. She wanted to learn it, to remember it, so she could paint it. The richly accented voice splintered Calette’s concentration. She dragged her gaze away from the water to squint at the young man crouched beside her. Sparkling. “What?” The sparkles were disconcerting. Feeling strange and disconnected, she wondered briefly if he were real, or some dream sent to her by Thest. She pressed her fingertips against her eyelids, awareness gradually trickling back through her senses. “Nothing. Everything.” The sensation of being permeated with light dissipated. When she looked at him again, the spots of light in her vision were mostly gone. The only sparkles left were those from the gems in his ears, winking at her through the blond curls. “I know who you are,” she realized suddenly. He seemed surprised, and something subtle in him shifted. “I did not realize I was famous already,” he said. His casual expression masked an inner tension, more felt than seen. “Not exactly.” Perhaps she was approaching it wrong. Maybe it had more to do with the colors one left off the canvas instead of the ones you put on.She caught at one of the fallen braids, tugged at it absently. She caught her breath in her throat. Those eyes. Standing there on the bridge, the same light danced across his hazel eyes that had danced across the surface of the water. No one in Evreme had eyes so light, so it had never occurred to her to look in such a place for the colors she was seeking. But here it was in front of her, the very a palette she was seeking, in the eyes of a foreigner. Who was she to deny that the hands of the Broken God might sometimes reach out to those in need? She threw up a hand, pressed her fingers against his lips to silence him. “No, no. Why did you stop here. To speak to me now?” She lowered her hand again, but kept her eyes locked on his, light-touched, studying them with the same intensity as she had watched the water. She felt herself blush. Belatedly, she realized she had given him entirely the wrong impression, gazing so intently into his eyes. He was Jurati, for goodness sake! The islanders’ worship of the heretical Fourth Hand gave dispensation for all manner of licentious behavior, her father said. This one, bold enough to wear Aratanne’s symbol on a chain around his neck, probably thought she was besotted with him. She hesitated. He was probably jesting about the seduction, but the truth was she was desperate for the light he carried in his eyes she wasn’t sure she wouldn’t give in to his advances, if he made any. “Oh!” she said, feeling a surge of relief, and after that a surprising tinge of regret. All he wanted was her name. That seemed a fair trade for what she hoped to get. So she gave it to him. Edited Oct 21 2012: Stylistic changes mostly. But also changed the name of the POV char. The character previously known as Mariesa Fleuracy will hereafter be known as Nedalya Fleuracy, or Neda for short. My reasons for this have to do with the changing nature of the story. When she first entered this story world, some 10 years ago, she was nothing more than remembered Object of Affection. “Mariesa” was a good enough name at the time, though I never really liked it. Now that the character has evolved into a more significant role and become a person in her own right, I felt she needed a name with more weight behind it. Ergo the change. I’m really particular about names. And then there was art! 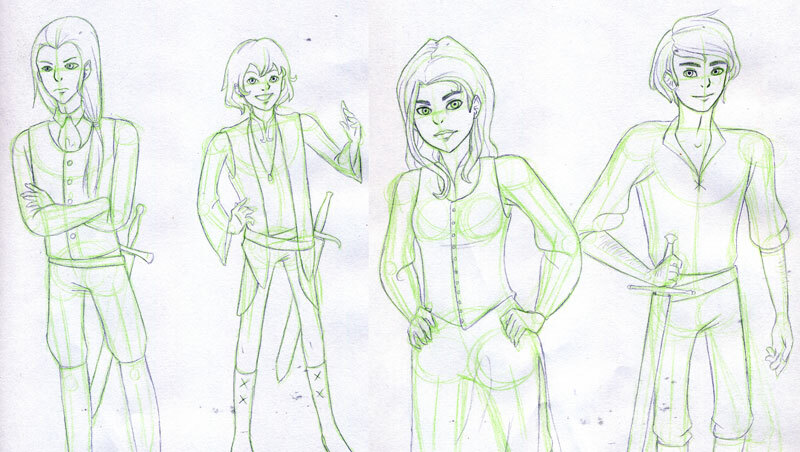 Barris, Romeric, Neda and Tierce, by Lucy W.
But it’s a start at getting some visual representation of these characters! But I think the personality conveyed in each expression is right on.